Your Next Canyon For A Day! 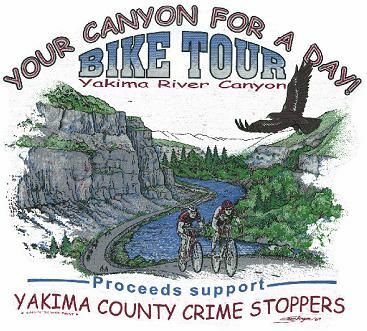 A 35-mile round trip ride through the scenic Yakima River Canyon. The road follows the Yakima River up a gentle grade with few hills. The highway will be closed to thru traffic. A perfect ride for the whole family! For those coming from the South-Yakima end, the staging area is at the Roza Recreation Site at milepost 7 on SR 821. For those coming from the North-Ellensburg end, parking has changed. It is now located off of Canyon Road across from Eaton Cattle and will be marked with "Crime Stoppers Parking" banners. All vehicles must be parked in an orderly fashion and no vehicles may obstruct the road/through traffic. There will be registration the day of the ride and T-shirts for purchase. NO DEBIT/CREDIT SALES ON DAY OF RIDE (we don't have wifi in The Canyon). Please bring cash or a check on the day of the ride for same day registrations.